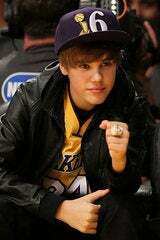 Yes, that's Justin Bieber wearing Phil Jackson's NBA Championship ring. That's one more ring than LeBron James or Chris Bosh have had on their fingers, despite preseason plaudits all-but-guaranteeing them a 70-win season. Just 70 more to go. The Heat played like a bunch of guys on a playground court thrown together for their first game. With just 15 team assists, it looked like the gameplan was a familiar one: wait around for LeBron to shoot. (Though to be fair, they also ran a few "wait around for Dwyane Wade to shoot and miss" plays.) The reliance on jump shots was curious; when you're bigger and faster than the other team, you don't want to get outscored by 14 in the paint. But that's what happened, not that anyone should panic, be you a newly-minted Heat fan or one of the numerous writers the Heat Index has on retainer. (Think they're going to be scrambling for content? It's opening day, and the front page still has a week-old story on Wade missing practice.) That mythical 70-win season probably isn't going to happen, but not because of one game. Statistically, going 70-11 is just about as tough as going 70-12. Wade's rusty, and maybe a little gimpy. LeBron's got to be feeling some pressure to outperform his own ridiculous track record. Bosh is terrified of screwing up. When the long season reaches the grind and they've got time to gel without every game being on national TV, when Chalmers and Miller are healthy, then the Heat will start reeling off wins like nobody's business. In the meantime, Miami is alone in last place in the Eastern Conference. And the Lakers, with essentially the same team that won a title last year, received their rings and started their defense. It's a long season.